Recently there has been a bunch a questions regarding pool equipment. Many of the questions revolve around the type of equipment, energy efficient pumps, filters, water flow and cleaning systems. I searched the internet (forums, blogs, chat rooms, etc…) to see what was being put out there and I’m sad to report that most of the information being provided is propaganda generated by the manufacturing companies in the attempt to sell their equipment. At California Pools, we try to provide honest information based on our 22 years of experience and let you make the choice for yourself. The first thing that must be realized when looking at the best equipment for your swimming pool, there are many variables to be considered. Some of the things that can dramatically impact your decision are: pump location in relation to the pool, elevation of the pool equipment in relation to the pool, type of cleaning system on the pool, how the plumbing will be run from the equipment to the pool, size/ type of pump, type/ size of filter, type of size of suction and return lines, how you plan to control the pool system….as you can see there is lots to consider. Every project site presents a unique building condition. For a company to say one set of equipment works better than another in all circumstances in a controlled environment does not always provide the information a consumer may be looking for. Many of the tests are set to favor the company performing the test in the effort to sell more of their equipment. I found the lengths that companies would go to prove their point amazing; such as hiring marketing firms to flood the internet with fake customers reporting inaccurate information about competitor’s equipment. Shame on them or good marketing on their part, I’ll let you decide. The equipment installed on California Pools projects is based on the best product for our customer. To help determine that, we go through a detailed design process to find out what is most important to our clients and then provide a recommendation based on our experience. The product that may be right for one customer may not exactly benefit another. For example, we like to use Hayward equipment on most residential projects. We have partnered with them for 22 years and have found them to be the most versatile set of equipment on the market blending the best of efficiency, water flow, noise and warranty. We have several pumps to offer via Hayward and we try to identify the best fit with our clients. Here’s an example of one of the discussion we have with our customers: The Hayward 2 speed pump is a great energy efficient pump when used in the proper configuration. The ideal circumstance is using this pump with a vacuum cleaning system and an automatic controller. When using a vacuum cleaning system, the vacuum can clean the pool in about 3 hours in the high speed mod. 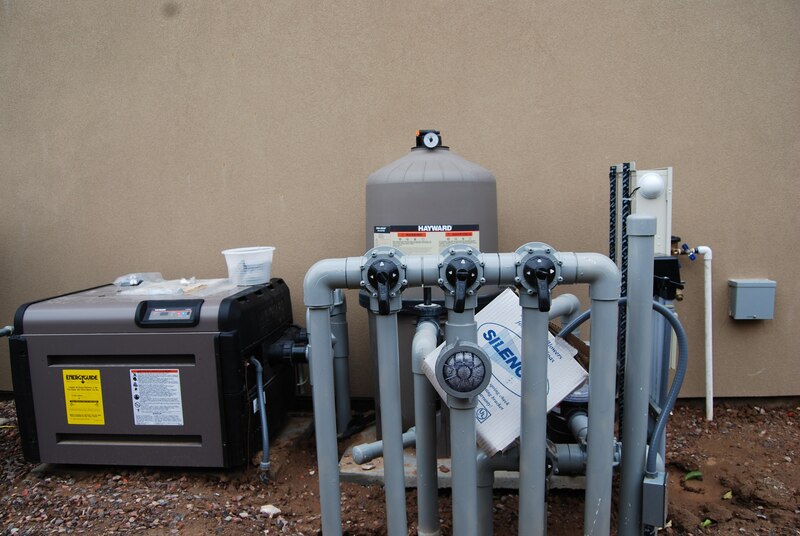 The control system then can adjust the pump to a lower speed for the remaining time needed for filtration circulation, where you can enjoy the energy savings. The same 2 speed pump is not a benefit when used with an in-floor cleaning system. The in-floor cleaning system will need to be run in high speed to drive water to through the heads in the floor to make them work for approximately 12 hours to sufficiently clean a pool. This is more than enough time needed for water filtration and leaves no time to run the pump in the lower more efficient speed. Hayward my not be the product for you, that’s fine by us. We are happy to install any product you wish. In many commercial application where water turn over rates are extremely important to Maricopa County Health Department and pump noise /energy efficiency is less important the owners, we use Pentair pool equipment. Finding the best products for you is as easy as picking up the phone. Our project managers will come out and design the project of your dreams at no cost to you. Once we have won your trust to build your project, the same project manager will oversee the building process. You see, their job does not end at the point of sale. They are involved now, tomorrow and far into the future. Their goal is a happy client that sends us more customers. Since they sit and design the project with you, they know best what’s important to you. One last note, we have found that equipment warranty is extremely important to our customers. Hayward equipment allows us to provide the best warranty on the market and we are proud of it. The products we provide to the consumer have a 3 year parts and labor warranty. We DO NOT CHARGE deductibles for our warranty. We believe in a better way of doing business than trying to get by with the 2 year minimum standards set by the state.